Three students from the UO’s Clark Honors College are in Chicago this week to pit their brains, rather than brawn, against student teams from schools competing in the Sweet 16 round of the NCAA Men’s Championship basketball tournament. Bracket Genius is a bracket-style, winner-take-all game show in which three-person teams representing the final 16 schools in the March Madness men’s college basketball tournament compete in a trivia game show for a chance at winning the grand prize of $100,000 in scholarships to be shared equally among winning teammates. The competition is designed to let contestants show their school spirit and pride while emphasizing academics with trivia categories including arts, geography and politics, history, pop culture, science, and sports. Twenty-four UO contestants battled it out in a preliminary elimination round earlier this month at Falling Sky in the EMU for the honor of making it onto the final team. Nadav Menashe, a biology major with psychology and chemistry minors; Bryce Thompson, a cinema studies and humanities double major with history and English minors; and John Dechert, a math major, prevailed. Collectively their interests and academic strengths cover a variety of subject areas. During the preliminary elimination round, Menashe correctly answered the question, “Name the famous portrait photographer who has taken pictures of people such as John Lennon and Miley Cyrus?” earning him a spot on the team. For Dechert, the question that made the difference was, “What is the oldest commissioned ship in the U.S. Navy to have sunk an enemy vessel?” The answer is the USS Constitution. 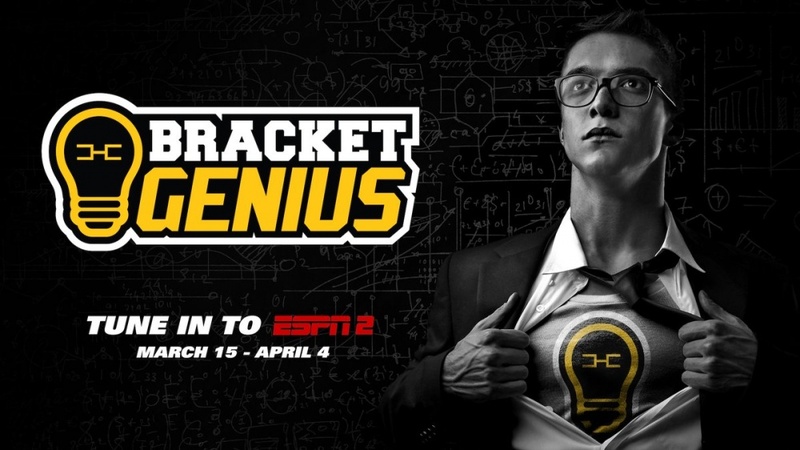 Bracket Genius will air on ESPN2 or ESPNU and will also be available on the ESPN app, WatchESPN. Episodes will also be placed on ESPN3 for replay after each initial airing on ESPN2 and posted to ESPN VOD. Tip-off show, Wednesday, March 15, 3:30 p.m. Episode 1, Wednesday, March 22, 2 p.m. Episode 2, Wednesday, March 22, 2:30 p.m. Episode 3, Sunday, March 26, 2 p.m. Episode 4, Sunday, March 26, 2:20 p.m. Bonus episode, Monday, March 27, 3 p.m. Bonus episode, Monday, March 27, 3:30 p.m. Finale, Tuesday, April 4, 4 p.m. Both the Duck women's and men's basketball teams advanced to the Sweet 16 of the NCAA basketball championships. It is the first time the women's team has reached the round of 16.